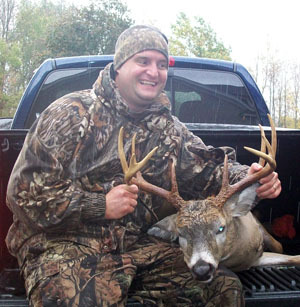 I got this buck on the opening Saturday of the 2011 bow season. He is a monster 10 point with a 19 1/4" spread and 10 inch G2 tines. He field dressed at 202 pounds. I am in the process of scoring him and it looks like in the low 130's! When I woke to the rainy weather, I wasn't sure whether to go out or not. I decided why not, I'll go to the one stand I placed near a 20 acre pine thicket surrounded on one side by corn and the other side by an overgrown golden rod thicket. I figured with the rain and wind they might be bedded near the pines. Boy, did I call that one perfect! At about 8:15 a.m., I noticed a small tree about 60-70 yards away going back and forth vigorously. I watched it for a few minutes, but couldn't tell what was making it do that. Suddenly I saw horns going up and down on the tree. I stood up in my stand, grabbed my bow and blew my grunt and snort wheeze at the buck. All of a sudden at a steady walk he started walking right toward me, huffing and puffing with his chest out and horns held high. I started to shake like the tree I was in (because of the wind). He stopped at about 45 yards, looked around and... guess what? He laid down behind a downed tree! I didn't know what to do. He laid there for over an hour and all I could do was watch him. I didn't have a good shot. I then had to try and calm myself back down. At about 9:20 a.m., I was going to break some sticks in the tree to get him up. Then I spotted movement to my left, and down another trail comes four small does. Those does came right in and milled around my stand. The buck spotted them and got up! He started chasing the does around my stand for about five minutes. I couldn't get him to stop. Finally, the one doe laid down and he started nudging her with his horns to get up. He was broadside at about what I figured to be 30 yards. I had some small brush in the way, but I had some openings. I drew back and whack... I smoked him! He kicked out and ran over the doe (she limped away) and ran through the woods like a freight train. I never heard him go down. I was going to give him a while to before tracking, but right then the old heavens opened up. I had to get down before all my blood trail was washed away! I got down and found my carbon arrow with the RAGE broadhead. It was bright red blood with bubbles... I knew I hit lung. I started tracking and found gobs of blood here and there, but not constant. I got to the golden rod field and lost all sign of blood (the rain seemed to be washing it away). I started doing small circles in the field and nothing. I was bummed. I lost my father this past spring, so I looked up in the sky and said Dad help me out, you got a heck of a better view than I got. Where is he? Within 30 seconds, I had this thought to go North a little in the field and then veer to the West and head towards this briar patch. All of a sudden I walked up on a spot where he fell down and blood was everywhere. I went another 20 yards and again he fell over. I looked into the briar patch and there he was all piled up! I will say this, my father helped me find that deer! It was pouring rain and I needed a little faith! That buck went over 150 yards on a complete cutoff of his diaphram, one lung and the top of his heart. Amazing! This is the biggest bow buck I've ever gotten and probably will for a long time. I love hunting!